MACOMB, IL – The Western Illinois University Department of Communication Sciences and Disorders (CSD) will host CSD Day Monday, Nov. 13, in conjunction with an upcoming Discover Western event. The day will be an opportunity for potential students to interact with faculty and current students to learn more about careers in speech-language pathology and audiology. The event will also include a hands-on look at the department's equipment, a chance to observe the department's clinic on a typical working day and end with lunch with some current students. 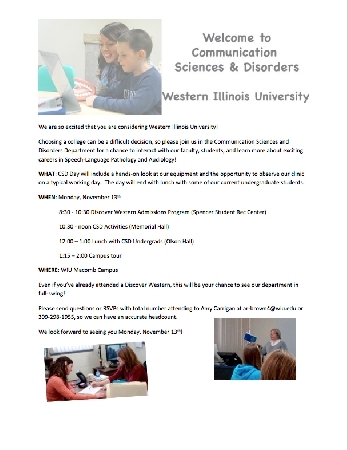 For more information or to RSVP, email AR-Brown@wiu.edu or call (309) 298-1955.